GUEST BLOG: We're constantly amazed at the diversity of the peeps that travel with us and love to hear about their interesting back stories. 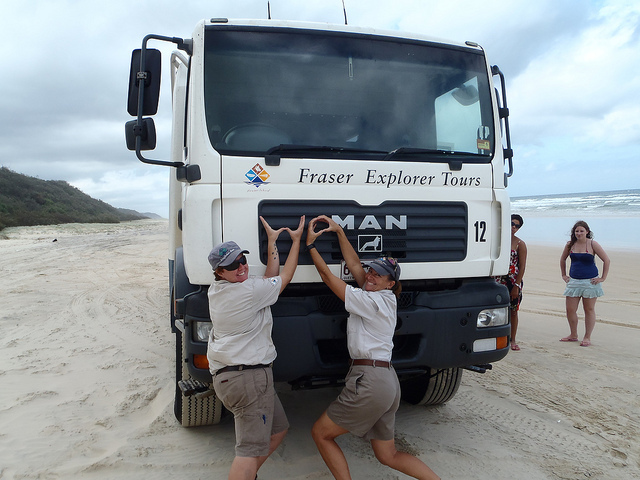 It's pretty cool too when they flick us an email, Facebook post or tweet to tell us they've loved Cool Dingo and Fraser Island and can't wait to tell the world! So we'd like to introduce you to another of our Cool Dingo travelling alumni - 22-year-old Deborah - world traveller, graduate student, crazy funster and prolific blogger. In her own words, Deborah "amuses myself by over analysing news, gossip, music, films, and insignificant goings on in the form of sarcastic blog posts." There's no b/s here - just some cool stuff about about her time on the world's largest sand island with Cool Dingo's pocket rocket, Ranger Kirstey (and Kirstey's pics). Enjoy! Travelling is all about decisions, and important ones too. Where to go? If you’ve only got a few days somewhere, you don’t want to waste them all in a crummy town that you once read had a cheap bar but turns out to have nothing else. Where to stay? Budget youth hostels and sharing bunk beds with any number of weird strangers, or expensive hotel, and be out of pocket, comfortable and bored? Who to go with? You don’t want to go with someone you kind of know from one of your modules at uni, only to find out they have weird habits like chewing mints instead of brushing their teeth or not wearing shoes and saying stuff like ‘I like the feel of the soil under my feet’. Thankfully, although people always warned me it was a bad idea to travel in groups of three, it has worked out for us so far, and we’ve found it kind of useful. Two night or three nights in a place? Pizza or pasta for dinner? Remove the spider from the room or pretend it isn’t there? All our decisions have been made swiftly and easily – majority rules, and if the odd person doesn’t like it, they can do what they want on their own (which is why I’ve ended up in Subway so many times while my two thinner companions eat salad). 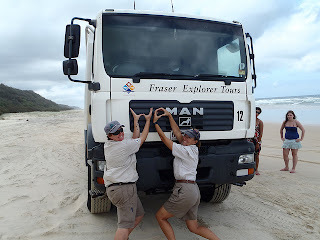 How to see Fraser Island, the world’s biggest sand island and a must-visit for anyone, backpacker or not, visiting Australia, was the first big decision the three of us struggled to make harmoniously. Everyone we’d ever spoken to (or stalked on Facebook) who had visited Australia had done Fraser Island in the typical backpacker way: paying around $350 for two days, two nights of camping, getting around by driving their own 4X4 cars on the beach, pitching their own tents, making their own food and generally having a blast. 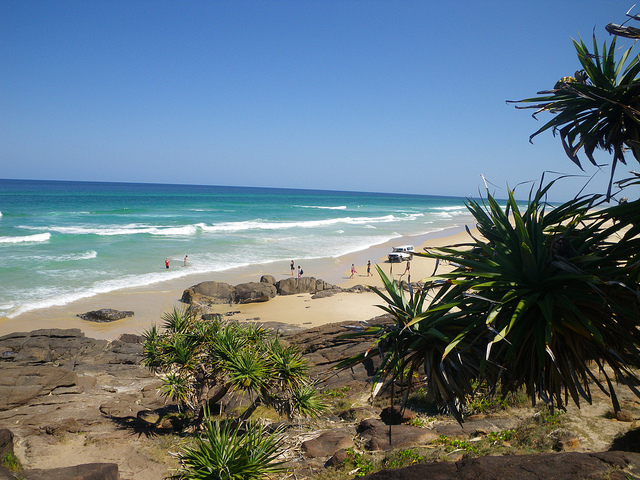 He explained that for even cheaper, with a company called Cool Dingo, we could get three nights on Fraser Island in lodge accommodation (with toilets! and showers! ), including all our food and a guided tour every day on a big 4X4 bus. ‘I just don’t understand why it’s the same price,’ I kept saying. And I really didn’t. How could we get our own beds, cooked meals and a guided tour for less money than sleeping on the soil moments away from snakes and Huntsman spiders? It turns out that the company that lets you drive the 4X4s yourself has to pay a huge amount for insurance as so many idiots think it’s funny to drive into the sea or simply can’t control the cars on the roads, which are sandy and basically run as smoothly as Katie Price’s average relationship. After hours debating whether we’d rather have the ‘proper’ Fraser experience of sleeping in tents and driving the cars ourselves, we agreed to do the tour with Cool Dingo. It was one of those awkward moments where I had to make the decision, because both of my friends wanted to do one tour in particular, and I could have been swayed either way. Yet having camped in a tent every summer in England for a couple of weeks, I had ‘experience’ enough of being damp and stinking and uncomfortable for days on end. Hygiene is hygiene, no matter how much fun you’re having. I can still smell the Portaloos years later. No regrets. The Cool Dingo tour was fantastic (we even saw an actual dingo). Our guide Kirstey never stopped smiling (even when we burst a tyre in the middle of the beach) as she drove us down ridiculously bumpy roads, hiked through forests with us and took us to freshwater creeks. She even supplied us with apples, homemade cookies and cereal bars, and there’s no quicker way to my heart than with food (except perhaps an uncanny resemblance to Sawyer from Lost). Our first port of call was Lake McKenzie, beautiful and filled entirely with rain. After going in there, I’m never paying for hair treatments again – the water made our hair incredibly soft. If I hadn’t been squinting because of the strong midday sun, I definitely would have tried to pull off the Cheryl Cole L’oreal advert and swung my hair around, which would almost certainly have been a huge fail. We also trekked through a forest and took a much needed dip in Basin Lake. Excitingly, we unexpectedly saw a goanna on the ground – which looks like a tiny crocodile – peering at us with suspicious eyes. That wasn’t as terrifying as Laura’s experience with a goanna – she went to throw her food in the bin only to have a goanna appear out of the bin bag. When she shrieked, the cook advised her to lie down on the floor, because the goanna might think she was a tree and climb up her. Creepy. As backpackers wanting to ease some of the pain of carrying all that weight on our shoulders (literally painful shoulders, not in some ‘cry me a river I’m having so much fun’ metaphorical way), the best news was yet to come – as part of Cool Dingo, we were allowed to swim and hang out in the jacuzzi at the nearby swanky Kingfisher Bay Resort. A true gap yah experience. The next day, we drove along the 75 Mile Beach, all the while Kirstey telling us of Aboriginal stories from the 19th century about how Fraser Island came to be called so. 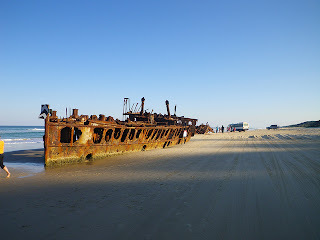 We stopped to gaze, dumbfounded, at the surreal Maheno shipwreck, a luxury cruise ship built in 1905 which, after a series of unfortunate encounters, came to be washed up on the Fraser Island shore. Driving along the beach was fun and surreal in itself – apart from the occasional spritz of water spurting up at me from the bottom of my seat, making me feel like I’d been peed on by the ocean. We also climbed to the top of Indian Head and gazed out at the turtles and jellyfish swimming below, swum in Eli Creek and The Champagne Pools (unfortunately not actually filled with champagne) and visited the coloured rocks along the shore. Our last stop before a final delicious (and all you can eat…mmm) Mexican dinner was the jetty to watch the sun go down on the beautiful Fraser Island. They are taking hundreds of dollars off you, and getting a huge commission, so don’t be scared to ask for every answer you want. I’ve no doubt the people going on the standard 4X4 Fraser Island trip had a great time too, but if we hadn’t been pushy and ant-phobic, we probably wouldn’t have found out about the Cool Dingo tour, which exceeded all our expectations, from the spotless accommodation to delicious food to perfect tour guide – and all for a reasonable price. This blog was originally published on http://oneeyebrowraised.com/ and was reproduced with the author's permission. Photos used in this blog post are from Kirstey's personal collection and are (c) Cool Dingo Tour.